Don’t underestimate this little island in the Indian ocean – Sri Lanka offers a tremendous amount of wildlife and biodiversity for its size. 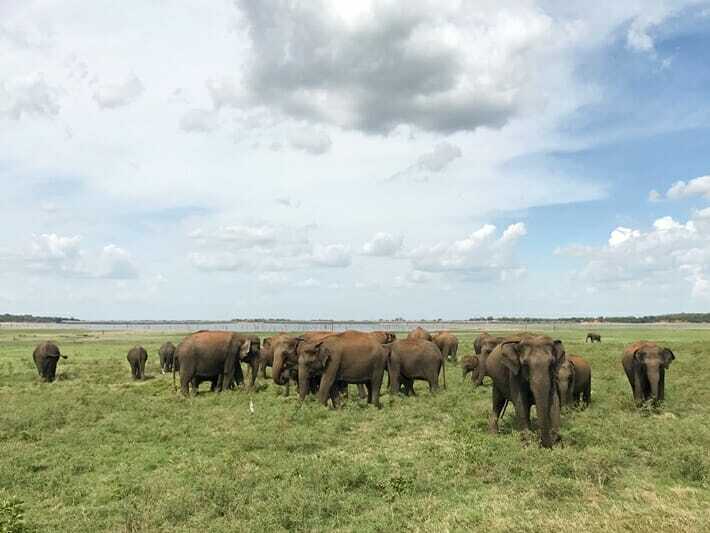 It has a dozen or so national parks, the most famous of which being Yala and Udawalawe, and is home to an estimated five to six thousand elephants in the wild and 120 to 200 in captivity according to the World Animal Protection Organization. 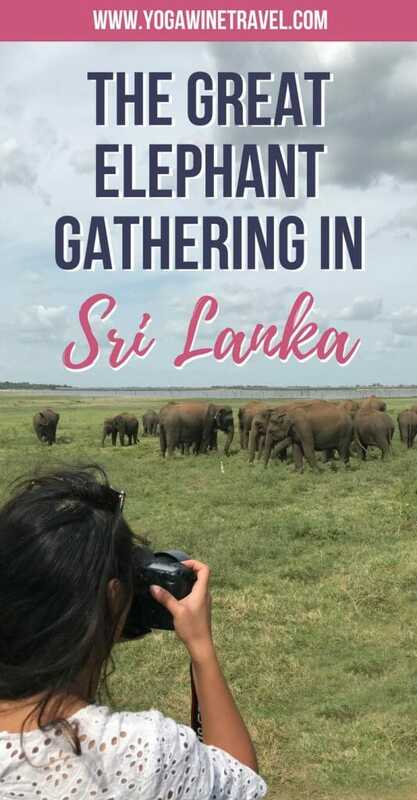 If you want to participate in ethical wildlife experiences and love animsl, read on for where to see elephants in Sri Lanka! 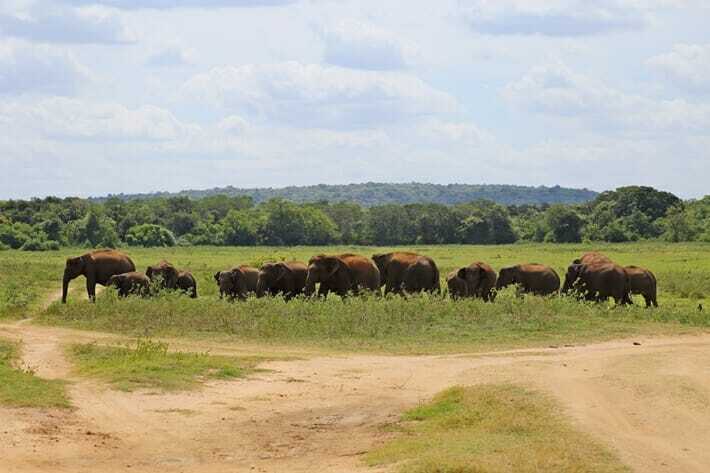 Although Yala and Udawalawe National Parks are both incredible, Minneriya and Kaudulla National Parks are worth visiting if you are planning on spending time in Sri Lanka’s cultural triangle in the Central Province. 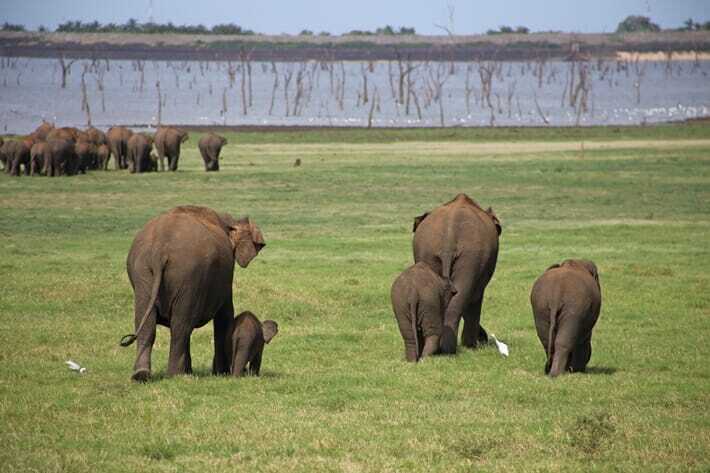 In addition to exploring the ruins at Polonnaruwa, climbing Lion Rock in Sigiriya and checking out the cave temple in Dambulla, you can also potentially witness the largest gathering of Asian elephants in the world on a Sri Lanka wildlife safari. Looking for more Sri Lanka travel tips and destination guides? Click here for everything you need to help plan your trip to Sri lanka! While there are hundreds of elephants in Yala and Udawalawe, this massive-scale congregation of elephants only occurs in Minneriya and Kaudulla; here’s the catch – it only happens once a year during the dry season. Here is everything you need to know to try to see “The Gathering” in Minneriya and Kaudulla National Parks! What is “The Gathering” and why should I visit Minneriya and Kaudulla National Parks? 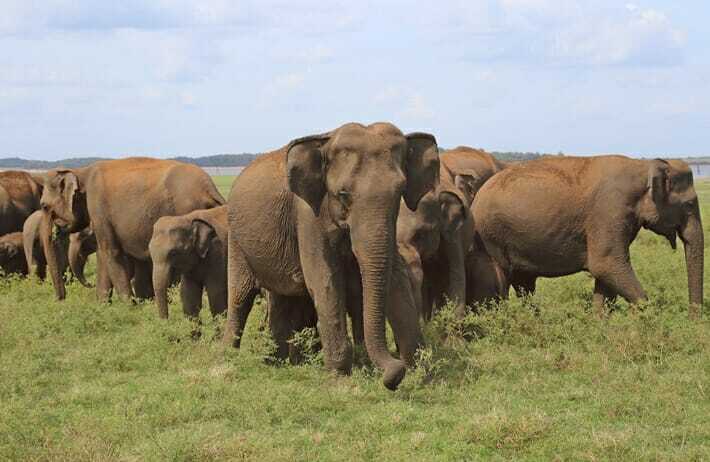 Once a year, the Asian elephants of Minneriya and Kaudulla National Parks congregate for what is known as “The Gathering”. The two parks, though separate, are next to each other and divided by the “elephant corridor” jungle that stands between them. This is precisely why I have chosen to write about the two parks together, because the elephant population in this region frequently travels between the two. HOTEL RECOMMENDATION: EKHO Sigiriya (formerly named Zinc Journey Sigiriya) offers beautifully decorated rooms, incredible service and is right next to Sigiriya Rock. 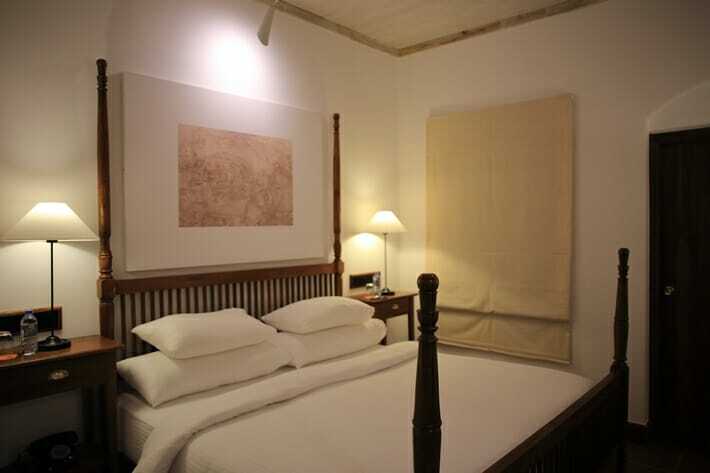 The hotel staff can also arrange safaris to Minneriya and Kaudulla National Parks. Click here to book your stay at EKHO Sigiriya or click here for some other accommodation options in Sigiriya! The Gathering is believed to be the largest gathering of Asian elephants in the world and takes place during the dry season from June/July to September when the rivers dry up and the elephants are forced to travel to large reservoirs in Minneriya and Kaudulla to bathe, find drinking water and graze on fresh grass. The reservoirs are also surrounded by jungle and dense shrubs which provide shelter for the elephants during sweltering hot days. In the afternoons, the elephants begin to emerge in their herds, a few at at a time until there are dozens (and sometimes even hundreds) hanging out on the plains. 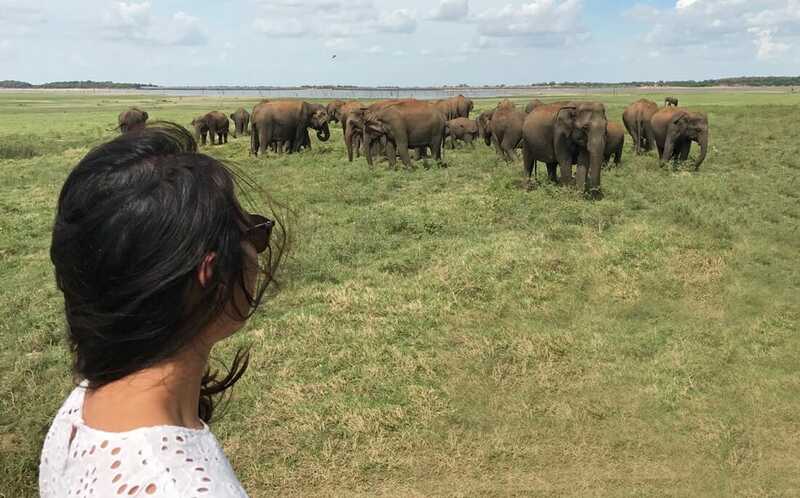 Sri Lanka has done a wonderful job of protecting its wildlife while also making it accessible to visitors, and there is no better place to observe an animal than in its natural habitat. 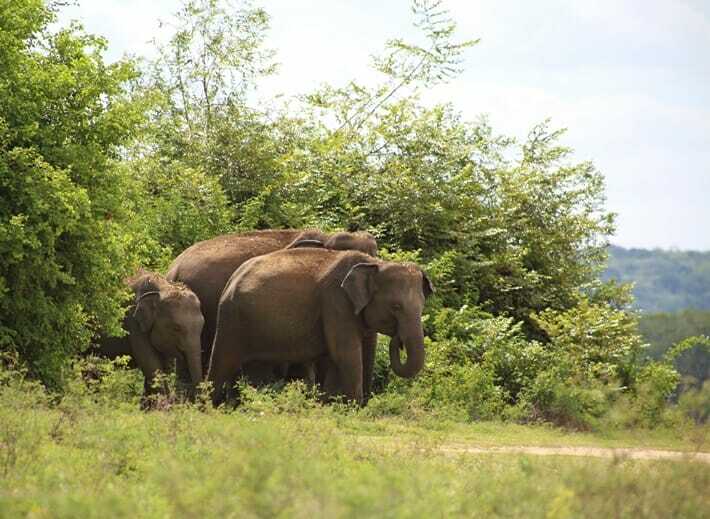 I would highly recommend going on a Sri Lanka safari in Yala, Udawalawe, Kaudulla or Minneriya over visiting one of the elephant “orphanages” in Sri Lanka (with the exception of the Elephant Transit Home which returns baby elephants to national parks to re-integrate with wild herds once they turn five years old). It’s no coincidence that I have avoided promoting a certain orphanage that many travelers have chosen to visit. From the WAP’s Research Report on the conditions for elephants used in tourism in Asia: “A true elephant-friendly venue is purely observational for visitors, where the safety of visitors and wellbeing of elephants is not affected by the need to constantly control the animals. The elephants would be managed in humane ways through the mahout who allows a maximum of freedom or through advanced ‘protected contact’ techniques.” Read more here. How can I see “The Gathering” of elephants and when is the best time to visit Minneriya and Kaudulla National Parks? The Gathering takes place during the dry season from June/July to September. I found out about The Gathering last-minute when I was in Sri Lanka at the end of August in 2017, and jumped at the chance to witness the event before the dry season ended. After rescheduling all of my travel plans, I hopped in a van for 7 hours and embarked on the long road from the Southern Province to Sigiriya. To get to the two parks, you will first need to travel to the Central Province. If you are traveling from Colombo, the drive to Sigiriya/Dambulla will take you approximately 4 hours. 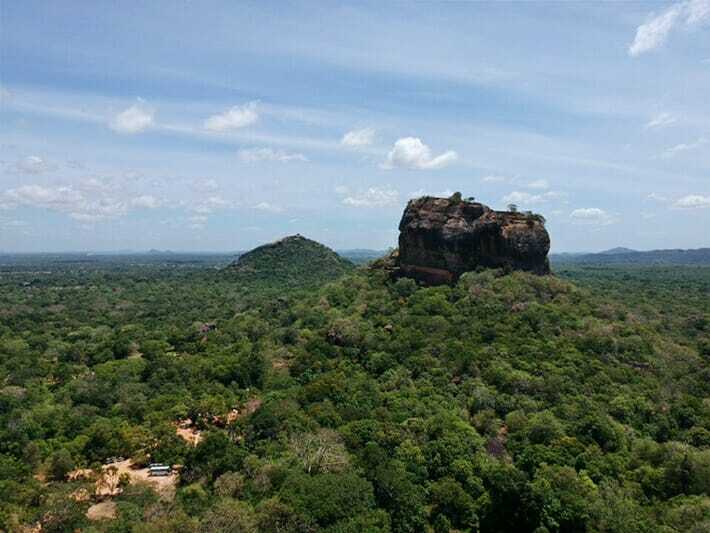 From Sigiriya, the drive to Minneriya National Park will take approximately 30 minutes, and the drive to Kaudulla National Park will take just under an hour. It is important to find a guide who knows what they’re doing, because I had initially booked to visit Minneriya National Park, but imagine my surprise when the guides told me that I should be heading to Kaudulla National Park instead! The guide told me that based on his experience from the past couple of weeks, many of the elephants had crossed the “elephant corridor” between the two parks and made their way to Kaudulla instead. For anyone planning the unique travel experience of witnessing the Gathering, ask your guide which park is most appropriate for that particular day – it changes as the elephants do move between the parks. The best time to visit Minneriya and Kaudulla is in the afternoon when the weather cools a little. Safaris typically start at 3 PM and finish at 6 PM. You may end up disappointed and not spot many elephants if you visit earlier during the day. Planning a trip to Sri Lanka? Click here for 12 things you should know before visiting Sri Lanka! How do I get to Minneriya and Kaudulla National Parks and where should I stay? The best way to get to Minneriya and Kaudulla is by car, and the best place to stay is in Sigiriya. 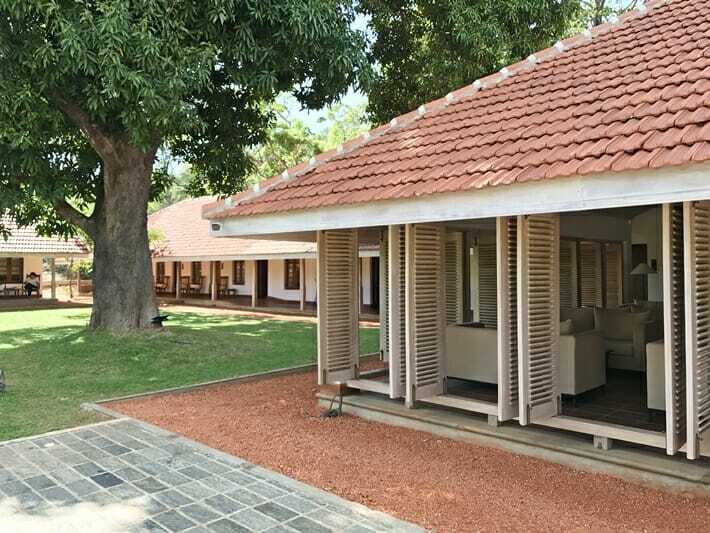 There are plenty of accommodation options in Sigiriya: I booked myself into EKHO Sigiriya – it offers beautifully decorated rooms, incredible service and is right next to Sigiriya Rock. The rooms are spacious and some even open up to the front garden – you can even see the rock from the hotel! The hotel staff can also arrange safaris to Minneriya and Kaudulla National Parks. Click here to book your stay at EKHO Sigiriya or click here for some other accommodation options in Sigiriya! 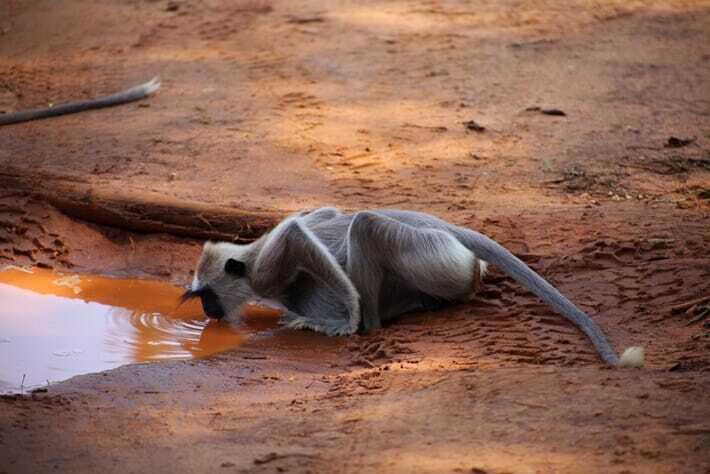 What can I expect from a wildlife safari in Minneriya and Kaudulla National Parks? Once you get to the park, you’ll be driven to the ticket office where you need to pay the park entrance fee (between 2500-3000 Rupees or $15-20 USD per person) – it’s best to pay in cash. The drive through the park can be bumpy and rough and it’s not uncommon for jeeps to be vying for the best spots when animals is spotted. 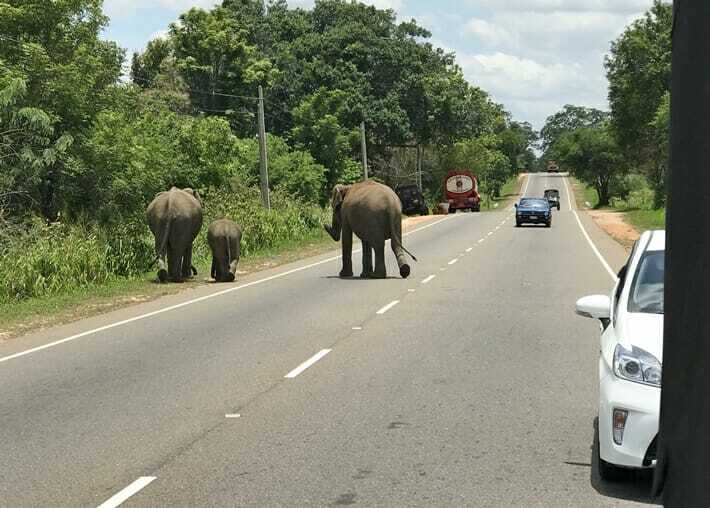 You are not allowed to drive up close to the animals or harass them, and most drivers will stick to the roads and turn the engines off around the elephants. Don’t encourage your driver to chase or corner wild animals! Click here for 15 things to avoid doing in Sri lanka! Once you are in the park, your driver should head straight to the reservoir to wait for the elephants to emerge in the afternoon. While you are waiting, ask your driver if he/she can roll back the canvas top so that you can stand up for a better view. 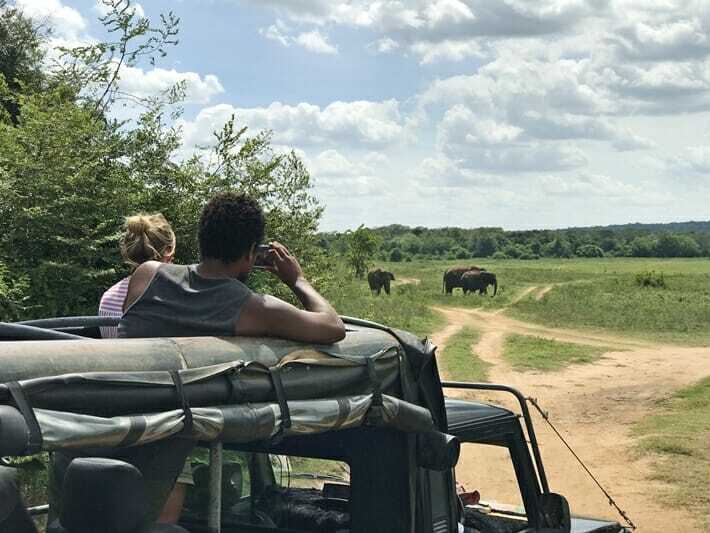 Unlike Yala and Udawalawe, many safari jeeps in Minneriya/Kaudulla will allow you to roll back the canvas top for an open-top experience. You must stay in the vehicle as there is only 1 spot (away from the main reservoir) where you are allowed to step out of the jeep. Lo and behold, 3 PM hit and we heard rustling from the dense jungle…then one elephant made her way out. Followed by another, and another, and another. Soon, the lush green plains surrounding the lake were filled with several herds of elephants – at least 40 to 50 beautiful, happy, wild and free pachyderms. There was even the tiniest newborn baby elephant who couldn’t have been more than a few weeks old. While we “only” saw 40-50 elephants, it is possible for the gathering to reach a few hundred elephants if you’re lucky. In addition to the large herds, you may also spot a few lone male elephants scattered around the park. At around 5:30 PM, the jeeps will start to exit the park in time for closing. Explore other ethical elephant orphanages, sanctuaries and national parks around the world here! What should I bring on the safari? The national parks are amazing destinations for wildlife photography. Bring a camera and zoom lens (75 mm-300 mm or even more zoomed in if you have one), you’re unlikely to get any good shots using your smartphone. Cash for the park entrance fee – bring Sri Lankan Rupees. You’ll also need a few small bills if you want to grab a roadside coconut on the way back. Bottled water (or even better, a reusable water bottle) as it does get very dry and hot in the area. Remember to take all your trash with you! Sunscreen and/or a hat, especially if you are planning on rolling back the canvas roof for an open-top safari experience. A hair tie or cap as the drive can get extremely dusty. Planning a trip to Sri Lanka? Don’t miss my two week itinerary for the Pearl of the Indian Ocean! Which national park should I visit? Udawalawe, Yala, Kaudulla or Minneriya? The various national parks are very different, and it is hard to recommend one over another. Here are some things to consider before you make a decision. Timing: If you are visiting Sri Lanka during the dry season (June/July to September), then you absolutely need to visit Minneriya or Kaudulla. If not, you can still visit these two parks, but it’s unlikely that you will witness The Gathering. 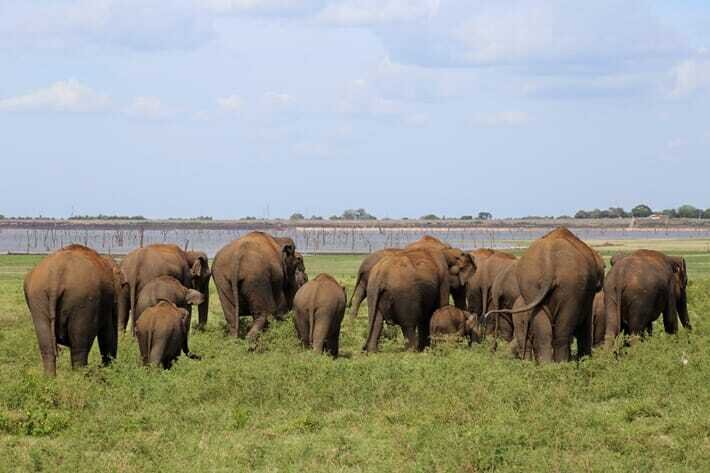 If you are visiting Sri Lanka from September to March, Yala and Udawalawe are fantastic options as well. However, it’s important to note that Yala National Park closes for 6-8 weeks each year, typically from the beginning of September onwards. Check the specific Yala closure dates here. Location: If you are visiting the Cultural Triangle, then head to Kaudulla or Minneriya. If you are headed to the beaches in the south, head to Udawalawe or Yala. 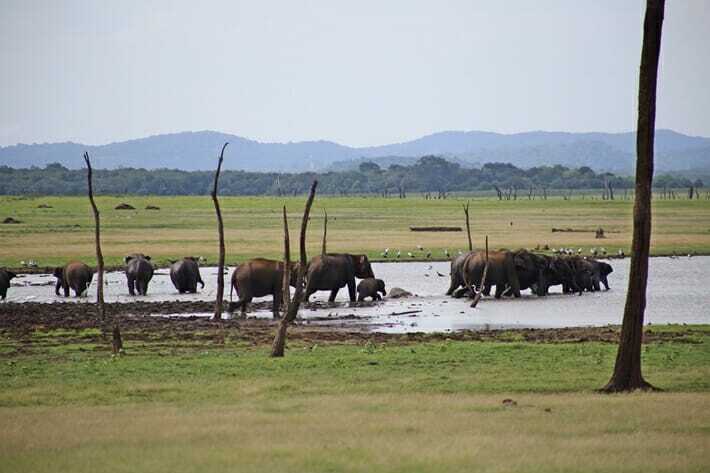 Popularity: If you want to avoid the crowds, avoid Yala. Udawalawe is much quieter in comparison, and Kaudulla/Minneriya are even quieter. During our time in Kaudulla, we only saw 6-8 other safari jeeps. Diversity of animals: Yala and Udawalawe both have elephants, water buffaloes, eagles, monkeys, crocodiles, deer and plenty of peacocks and birds. However, I did not spot any wildlife other than elephants and a few monkeys in Kaudulla. If you’re desperate for a chance of spotting a leopard, then Yala National Park is your best bet as it boasts one of the highest leopard densities in the world. Like all safaris though, a sighting is not guaranteed – I’ve been on three safaris in Yala and have yet to see a leopard. 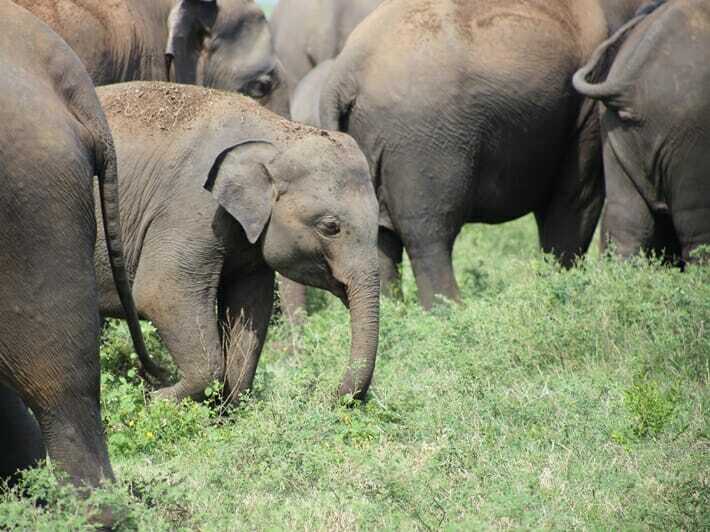 You are also likely to see a few elephants, though not as many as if you were to visit Udawalawe, Kaudulla or Minneriya. Udawalawe does have leopards (an estimated 1 dozen or so) but the chances of spotting one are extremely rare. Pricing: It costs approximately 11,000 LKR (approx 70 USD) for a safari for 2 at Minneriya, and 12,500 LKR (approx 80 USD) for a safari for 2 at Kaudulla inclusive of the 2500-3000 LKR national park entry fees. Prices accurate as of our trip in August 2017. *This pricing was corrected June 2018. The pricing at Udawalawe is approximately 11,500 LKR (approx 75 USD), and 23,000 LKR (approx 150 USD) for a 2-person safari at Yala. Prices for national park entry and jeeps tend to change slightly from year-to-year, so it’s best to ask your hotel directly to see what rates their partners are offering. Expertise of the guides: As the diversity of animals is lower in Minneriya and Kaudulla, I did find that the guides were much less knowledgeable about the animals than the guides at Yala and Udawalawe. This is to be expected, as they don’t need to spot hard-to-see animals and birds. If you have the time, money and energy, I would recommend that you visit two or more national parks (one in central Sri Lanka, and one in southern Sri Lanka), as it is absolutely breathtaking to be able to see the animals in their natural habitat. Have you been to Minneriya or Kaudulla National Park? What did you think? Share your experience with me in the comments section below! This article contains affiliate links. If you choose to book using these links, I will earn a small commission at no extra cost to you. Thank you for supporting my website by using these links, I only recommend products or services that I have had positive personal experiences with. Thanks so much for taking the time to read this, Linda! This is just too cute! I’ve been planning to go to Sri Lanka forever, it’s very high on my list – and I wasn’t even aware that there is such a rich animal life! I absolutely need to see these elephants gathering! SO. MANY. ELEPHANTS! You absolutely have to go on a wildlife safari if you visit Sri Lanka! I would love to come here and get up close and personal with the elephants (but not to ride them). I love checking out nature and wildlife on the road and seeing elephants in the wild is still to do on my list. Seeing elephants in their own habitat is an absolutely incredible experience. I hope you get to visit Sri Lanka soon Danik! We to believe in asking which area may be best for spotting instead of trying to go it alone. 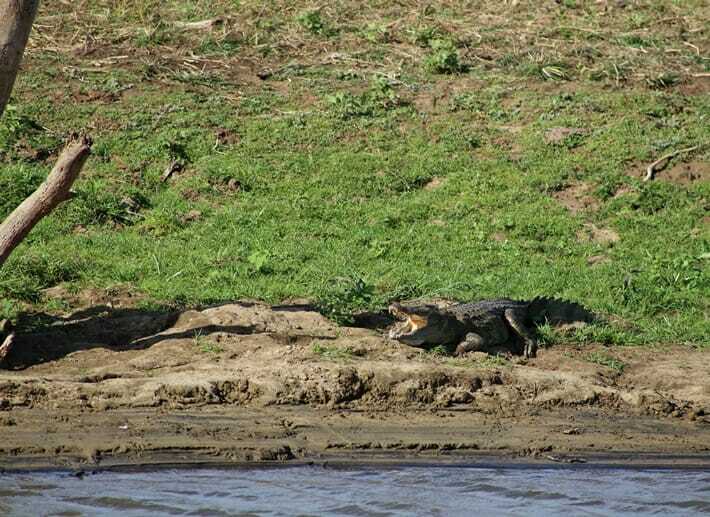 We had some great success when we went to Chobe National Park and had an extremely knowledgeable guide that took a different route and it ended up paying off big time. That is a pretty big herd of elephants. I can’t imagine the feeling of hearing the leaves and branches move and wondering when they are coming out. I’m so glad we listened to the guide! They do know what they’re talking about, and the guides in Sri Lanka openly share information with each other (for example, our guide spoke to a few other drivers who were leaving the national park to see if they spotted any big herds that day). Wow! This is interesting. Once I’ve attended such an Elephant Gathering in the Elephant Corridor at Kabini in India. Its just a visual delight to see so many at one place, right?! The hotel definitely looks super awesome. It is such a joy to see all the females hanging out with their babies! This looks like it was an amazing experience. Had no idea that some of the orphanages weren’t exactly mindful of promoting the animals’ best interest, but I guess I shouldn’t be surprised. Thanks for illustrating how to enjoy these creatures in a way that doesn’t cause them or their environment any distress. Gorgeous pictures as well. I think much of the time, tourists’ interests are placed above the animals’ well-being. I also believe in returning animals to the wild once they are rehabilitated/no longer injured – it is extremely do-able in a country like Sri Lanka that has so much protected national park space. Wow this is such an amazing experience! You captured it beautifully and the pictures are amazing!! Such a magical trip. Thank you for sharing this because I had no idea you can enjoy these beautiful animals without it involving cruelty. Thanks for reading this, Renata! 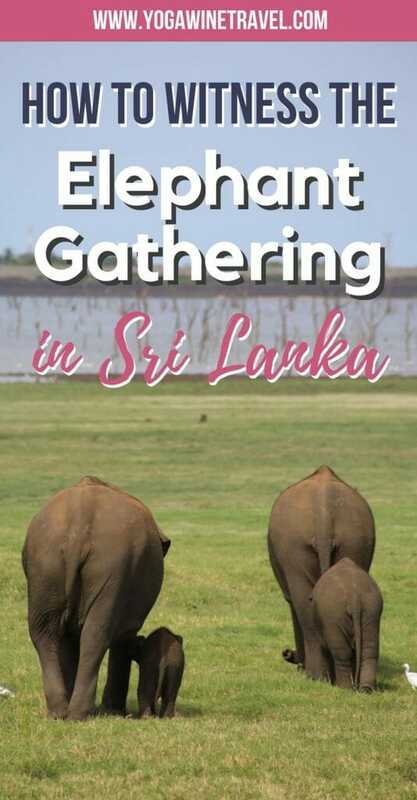 I’ve never heard of the elephant gathering in Sri Lanka and now you’ve really sparked my interest. It is definitely heartening to hear that the island nation is doing so much to conserve the environment and even undertaking projects to help baby elephants re-integrate back into wild herds. Would love to witness it for myself! I hope you make it to Sri Lanka soon, Nathan! It costs approximately 9,000 LKR (approx 60 USD) for a safari for 2 at Minneriya – you said! Can you share the contact of your guide? Hi Tiago, I booked the safari through my hotel as I mention in the post. The name of the hotel is EKHO Sigiriya (formerly known as Zinc Journey). They can help you arrange the safari directly – in my experience, you might be able to get better deals when you ask your hotel to book for you! The national park entry fee is additional – approximately 2500-3000 per person when we visited in August 2017. I apologize if that wasn’t clear, and will update the article accordingly. Thank you for pointing this out. We also did not pay for an additional transportation amount from the hotel as the safari jeep picked us up from the hotel directly. Hope that helps!